Also Recommended: Spirited Away, Card Captor Sakura. Notes: Based on manga by CLAMP. I had initial doubts about this anime, no thanks to Tsubasa Chronicle which contained cross-over characters from xxxHolic and I just happen to really, really dislike the former. Having said that, I am pleased to announce that xxxHolic is nothing like Tsubasa and I thoroughly enjoy this super-natural drama with a slice-of-life thrown in. 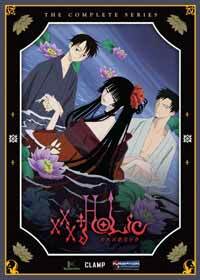 Now, I'm not normally a big fan of horror and super-natural anime, but I felt that xxxHolic has achieved something that most series in the horror genre does not have. xxxHolic's story is based on superstitious tales and folklore, rather than another dose of vampires that seem too common these days. And superstitious beliefs are something that is close to everyone's heart - we had all believed in it one time or another, especially when we were still young. Now that we are older and wiser, we tend to dismiss it all as hogwash. xxxHolic gives me a feeling that it trying to bring back the tales, tradition and culture, in a world of anime where science-fiction rules and where stories is nearly always centered on angst or finding one's identity and individuality or WORLD PEACE. In this light, xxxHolic is very refreshing. It may be little preachy for me to say this but every episode have meaningful lesson behind it; the price to pay for lying, greed, murder just to name a few. And given that it deals with the super-natural, some episodes are downright creepy and watching it alone in the dark can seriously raise some serious creep-factor. The most distinctive feature of this anime is the character design. It took me a while to get use to the long limbs of the characters and how extras are never given any features or colours beyond an outline. But I felt that this style has served to emphasize the main characters more because it makes them so prominent. xxxHolic is also produced by my favourite studio of all time - Production IG. The eye-candy will really take one's breath away, especially if you have seen the movie as well. I simply love the smoke bellowing about Yuuko and how the wind always seems to give Yuuko that mysterious aura. Yes, you can almost feel the wind. Unlike Tsubasa, there are only a few main characters and they are all very well developed. There's our long suffering protaganist Kimihiro Watanuki. He may be bogged down by his unnatural ability but that does not stop him from living a more or less normal life of a high school student. I truly emphasize with him and really root for him, especially when he is up against Yuuko who always seems to give him the oddest chores to do. Then, there's the highly unpredictable and ever sarcastic Yuuko (my favourite character!) who is more than meets the eye and I suspect still have tons of tricks up her sleeve that she has yet to reveal. There's the stoic Doumeki who shares a deep bond with Watanuki and the cheerful Himawari, the object of Watanuki's infatuation. A special mention must be given to Mokona, the creature in Tsubasa that I hated so much but have come to love in xxxHolic. As a mascot sort of character, Mokana actually managed to hold his own against the other characters through its personality. Secondary characters that appear every now and then are not carelessly tossed aside. They are given just the right amount of screen time such that it tease you and make you longed to know more about them. xxxHolic not only excels in its plot and animation, but in the music sector as well. Created by S.E.N.S, who also gave us the music to Kurau Phantom Memory, the music truly generates the mood of this series, especially the warmer moments provided by the Vestal Sprite. Combined with a stellar cast that fits the characters like gloves, this anime is a winner. Recommended Audience: Mature audience, preferably teens and above. Some of the episodes can be quite disturbing when some of Yuuko's clients meet with horrible repercussion.